Jake Elliott has one slice of pizza and one slice of cheesecake the night before every game. The Eagles kicker has had the same eating ritual since his freshman year of college. In Memphis’ ninth game that season, Elliott kicked a school-record 56-yard field goal that hit the crossbar and bounced through the uprights. He also connected on two other tries in the victory. Elliott believed there was something karmic about his kicking success that day, and thought back to what had not been a typical pre-game meal. It had to be the pizza and cheesecake! He’s had his ups and downs since, but overall, the routine seems to be working. Last year, the night before the Eagles were to face the Rams in Los Angeles, he sat at dinner waiting for dessert. Elliott didn’t disagree with the notion that he’s superstitious. Most Eagles players don’t use that characterization when talking about their pre-game customs. In most cases, they are performing acts that help prepare them mentally and physically to play at the highest level of a violent sport. They eat certain foods, wear certain gear, treat their bodies and warm up a certain way, and pray, meditate, and visualize in a certain manner. After a while, it becomes a professional routine. “I’ve just calculated this is the best way to do everything on game day,” guard Stefen Wisniewski said. “I’ve played so many games in my life, and just like the fact that I know exactly what I’m going to do gives me nothing to think about. Wisniewksi, now in his eighth NFL season, said that he eats the same meals, listen to the same music, and warms up the same way every week. For early games, he eats eggs, wheat toast, and blueberries. For late games, it’s steak and pasta. And contemporary Christian singers such as David Crowder and Shai Linne are always playing through his headphones. Linebacker Nate Gerry suits up in the same order every week. Left sock first, followed by right sock, left shoe, right shoe and all the way up to his helmet. Like Elliott, Gerry admits that he’s superstitious. Both are second-year players, though. A poll of most of Eagles, found that the younger players generally copped to irrational activity more than the older ones. The 33-year-old Long does have some habits that change on a yearly basis. He’s been wearing a Johnny Cash T-shirt this season. Last year, it was the Grateful Dead. He’s been having vanilla ice cream the night before games. Last year, it was chocolate. Maybe he should have stuck to chocolate since the Eagles won more games a year ago. Jordan Hicks, like Gerry, puts his left sock and shoe on first. But he takes it a step further if he accidentally starts with his right foot. Hicks said that what had started off as superstition during junior high has now simply become a habit. “I don’t think it has anything to do with my play,” he said. Tight end Zach Ertz had the same response about his pre-game practice of having a waffle – with chocolate chips, if they have it -- for breakfast. There are players, like Elliott, who eat the same food for more than nutritional value. Defensive end Michael Bennett will have salmon for either breakfast, lunch, or dinner because it doesn’t fill him up. The Eagles make sure the players get what they need whether on the road or at the team hotel before home games. When a player makes a request, the item stays on the menu. Steak and pasta is popular. Defensive end Brandon Graham and Wisniewski aren’t the only players who have that combo every week. Ice cream is always available. The Eagles aren’t exclusive. New wide receiver Golden Tate has had vanilla ice cream before games for years. Clothing can be worn for superstitious reasons. Linebacker Kamu Grugier-Hill said that he wears the same leggings and undershirt each week until he has a bad game. He switched after the opener against the Redskins last year but never changed again. Running back Corey Clement wore different cleats on his right and left feet after Wisconsin beat Rutgers in 2015. But he stopped once he got to the NFL. He said he didn’t know why. “I might go back to it,” he said. Cornerback Sidney Jones wore a “loc soc” to hold his dreads in place for nearly every game he played in college at Washington. He forgot to bring one to Lincoln Financial Field for this season’s Colts game and still played well. He said he then decided that he didn’t need to wear it anymore. Tackle Lane Johnson would likely approve. Quarterbacks Nick Foles and Nate Sudfeld have the same routine for every home game. They go to the NovaCare Complex practice facility, do contrast hot tub-cold tub, and on their way out play one game of pop-a-shot in the locker room. Foles dominated Sudfeld last year. It’s been the opposite this season, Sudfeld said. Several players, like Ertz and guard Matt Pryor, said that they like to take salt baths before heading to the stadium. Pryor said he uses the time in the tub to take mental repetitions of the plays. Linebacker LaRoy Reynolds said that he uses flotation therapy and that while he floats he meditates. Running back Wendell Smallwood and safety Deiondre’ Hall said that they watch cut-ups of film as positive reinforcement. For Smallwood, it’s plus-five rushes from each running back who already faced the team he’s playing. And for Hall, it’s YouTube videos of himself. For home games, players arrive at Lincoln Finanical Field at various intervals. On the road, two buses depart from the hotel at separate times. Tight end Dallas Goedert said that he’s always on the last bus. He said that he doesn’t want to arrive early for fear of spending too much time thinking about the game. Receiver Jordan Matthews said that he listens to sermons from Christian pastors such as Tim Keller and Francis Chan on his headphones before and after he arrives at the stadium. Quarterback Carson Wentz does something similar. 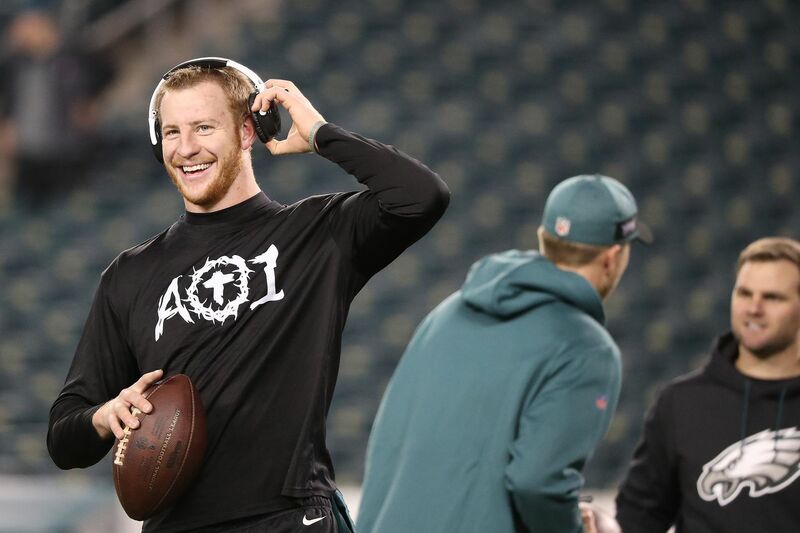 Most of the players, when they first take the field, are listening to music on their headphones. Linebacker Nigel Bradham prefers hip-hop. Center Jason Kelce’s bio in the Eagles media guide says that he listens to Christmas music pre-game, but he said that’s no longer the case. Each player has his own routine during the early portion of on-field warmups. Matthews catches passes with strobe glasses that flicker. Cornerback Rasul Douglas will have only assistant coach Dino Vasso throw to him. Foles also likes to field passes. Safety Malcolm Jenkins said that he isn’t superstitious, but that he has done the same dance in the locker room before every game since he arrived in Philadelphia five seasons ago. Tackle Jason Peters, the team D.J., turned on George Clinton’s “Atomic Dog,” knowing that it was a theme song for Jenkins’ fraternity, Omega Psi Phi. Jenkins obliged, although he has made attempts to stop. Guard Brandon Brooks has another way for knowing he’s ready. He said that he’s had to induce himself to vomit on occasion. Wisniewski said that he’ll sometimes sit at his stall, place himself outside the situation, and watch how his teammates act just before game time. Safety Tre Sullivan said that he tries to socialize with as many teammates as possible. Tackle Jordan Mailata said that he walks into the shower and soaks his head. Receiver Nelson Agholor said that he always makes a point of calling his mother so they can pray together. The entire team does gather for prayer just before parting. Then coach Doug Pederson says something. And then Long does. The Eagles are then introduced to the crowd. The national anthem is sung. And just before kickoff, guard Chance Warmack said he prays one last time.